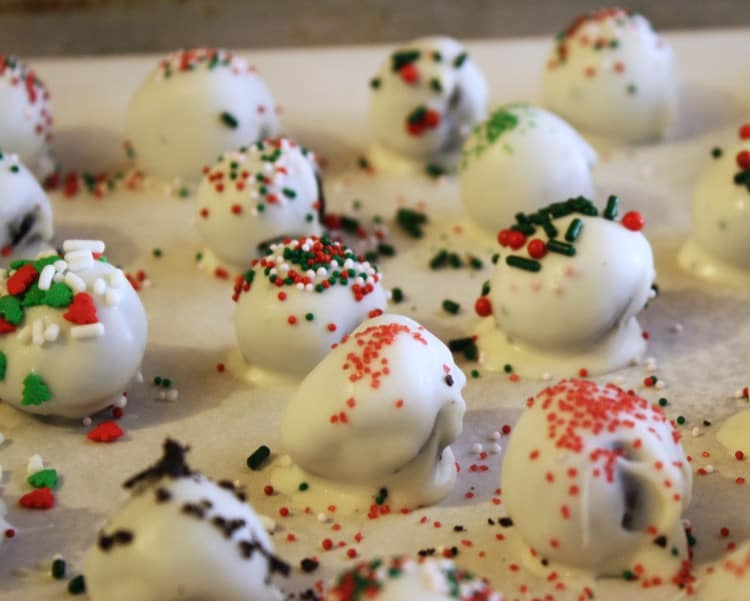 On my list of things to do this week was to make Christmas candy. It’s been difficult to do much of anything with a sciatic nerve giving me fits and being 8 months pregnant, but nevertheless, I pressed on and made quite a few goodies today. 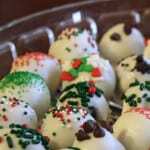 I want to write a post for each one, but that may take awhile, so I’m going to start by updating my Oreo Truffles post from last year. You could coat these with white chocolate, milk chocolate, dark chocolate, etc., but I like the contrast of the white almond bark – plus the decorations show up really well! 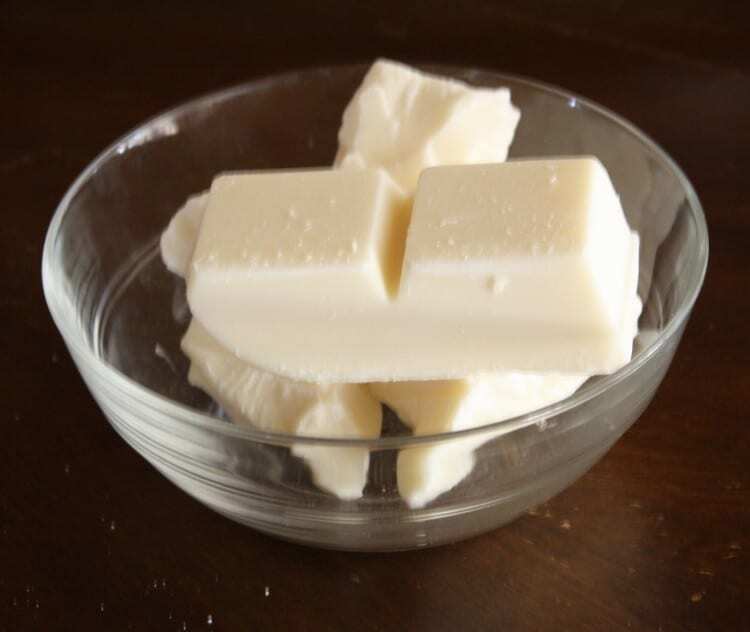 Start out by setting your cream cheese out to soften – I usually set it out for at least half an hour. After that, you’ll want to crush your Oreos. The fun way to do this is to put them all into a plastic bag, seal it up, and beat them with your rolling pin or the flat side of your meat cleaver. It’s a great stress reliever for you, or a really fun way to get the kids involved (which is what I usually do)! 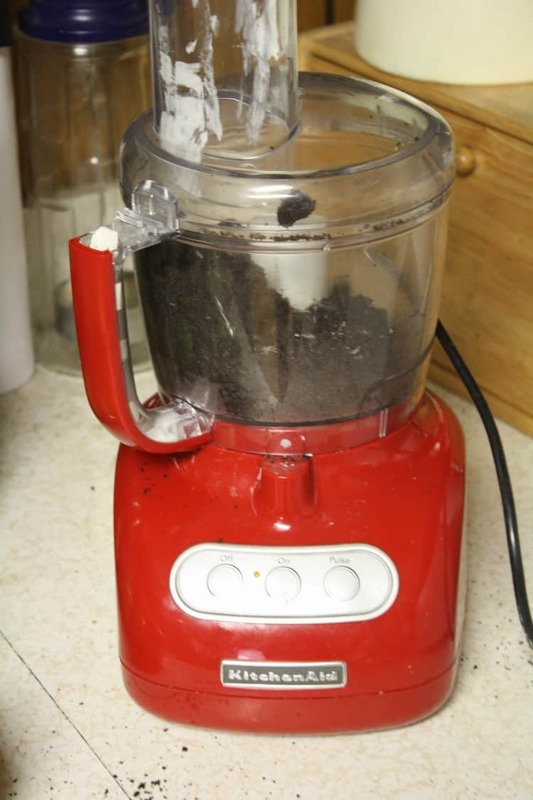 If you want to be a little less violent (or you’re pregnant and short on energy), throw them into your food processor. That’s what I did today. Usually after that I put the crushed Oreos and softened cream cheese in a bowl and smoosh it all together until you get a doughy mixture. Today I tried something different. I cubed the cream cheese and dropped it into my food processor right on top of the crushed cookies. I “processed” it for a few minutes and it actually turned out great! Plus, I messed up one less bowl, which is always a bonus in our house!! Next, you scoop out the dough and roll it into small balls…this is another great step that the kids can help with! Just make sure their hands are clean (always an issue for my country kids), and put ’em to work! Last year all the kids helped, but Noah was my biggest helper today. 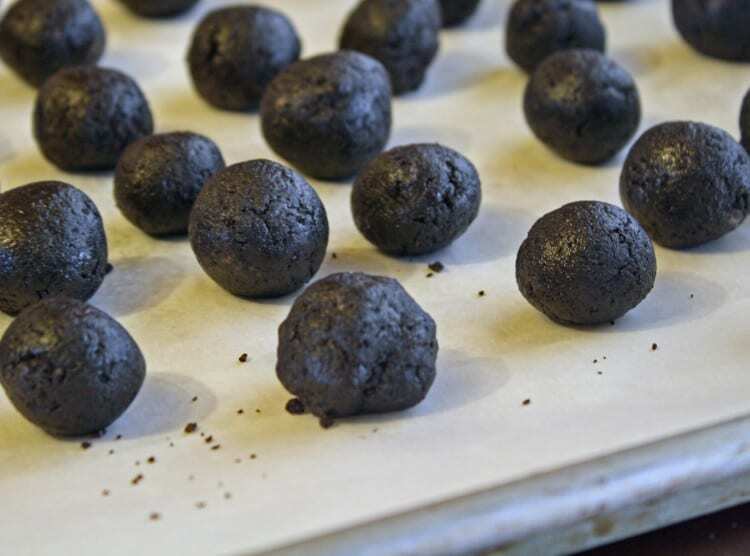 As you roll the balls, place them on cookie sheets with parchment or waxed paper. We put our balls on cookie sheets lined with waxed paper, then stuck them in the freezer for about 30 minutes. It makes them much easier to dip later. 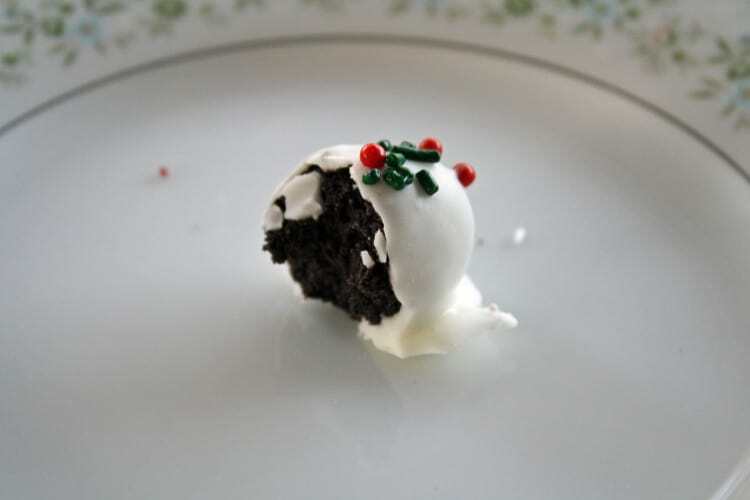 Right before you take the Oreo truffles out of the freezer, melt the white chocolate in the microwave. I put about 4-6 squares in a glass bowl and microwave for 1 a minute, stir, then microwave again for another minute, until creamy and smooth. Even if it’s not 100% melted, you can whisk it to get it really smooth. By the way, isn’t that the cutest whisk ever?? I got it when I did this deal from Head Chefs(which I think is coming back next week!). 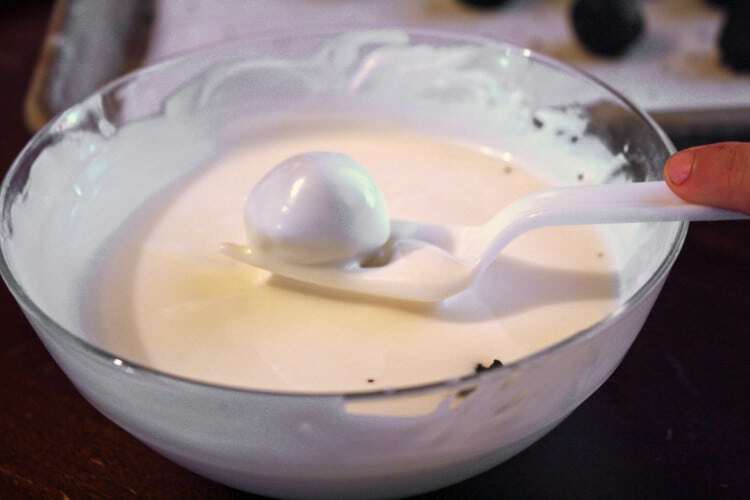 Next, drop your chilled Oreo balls into the white chocolate one at a time and use a fork to turn and coat them; then put them right back on the waxed paper. Oooh, for a dipper, I got this great tip from my cousin Michelle. Take a plastic fork, break out the 2 middle tines and it makes the perfect “dipper”! While they’re still “wet”, you can sprinkle them with anything you want. We did some with some leftover Oreo crumbs, some with mini-chocolate chips, but most, of course, we decorated with Christmas sprinkles! If you want, you can also drizzle them with melted chocolate or tinted white chocolate. You can see how I did that in my first post! When you’re all done, you’ll end up with about 90 or so Oreo truffles (depending on how small or big you make your truffles). I arranged a few of ours on a platter that I hope make it until Saturday!! And let me tell you, they are so super yummy!!! 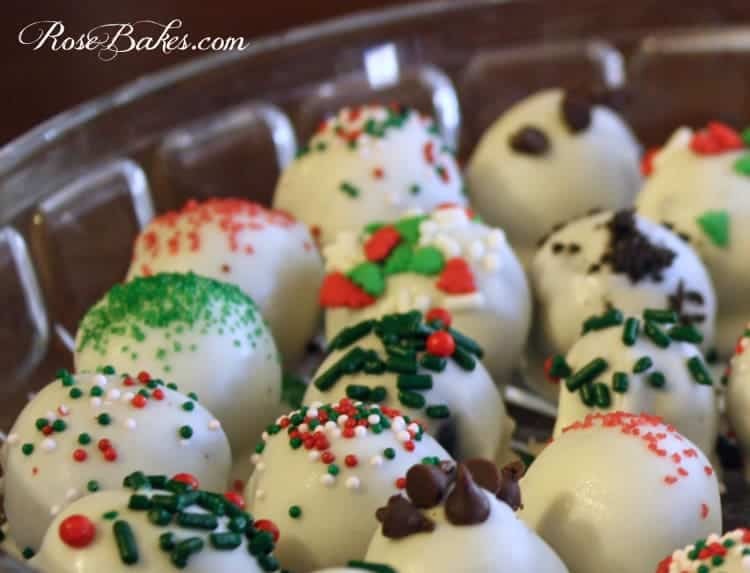 OREO Cookie Balls (or Truffles) are delicious, easy to make desserts that are perfect for parties on any occassion! 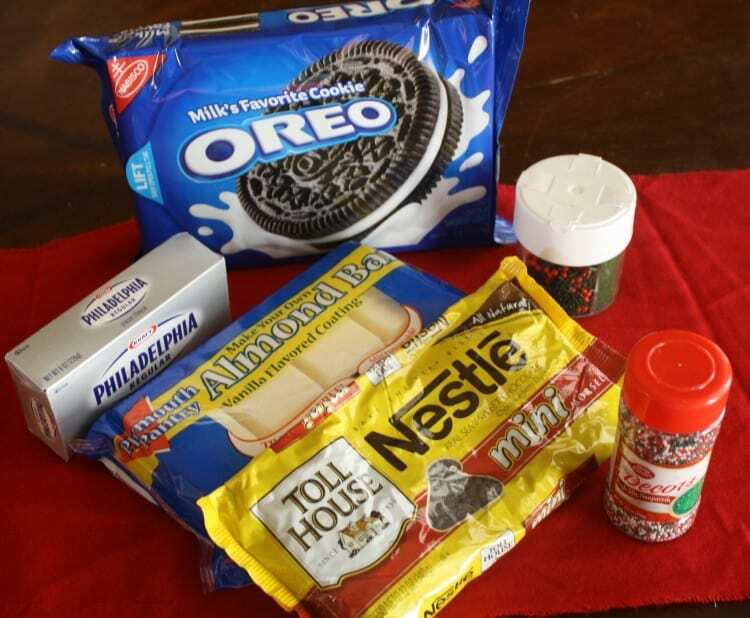 Mix the cream cheese and crushed OREOs until completely combined and a dough forms. Shape into 1 inch balls – or do them with a small cookie scoop. Place them on a cookie sheet lined with wax paper. Freeze for at least 10 minutes. 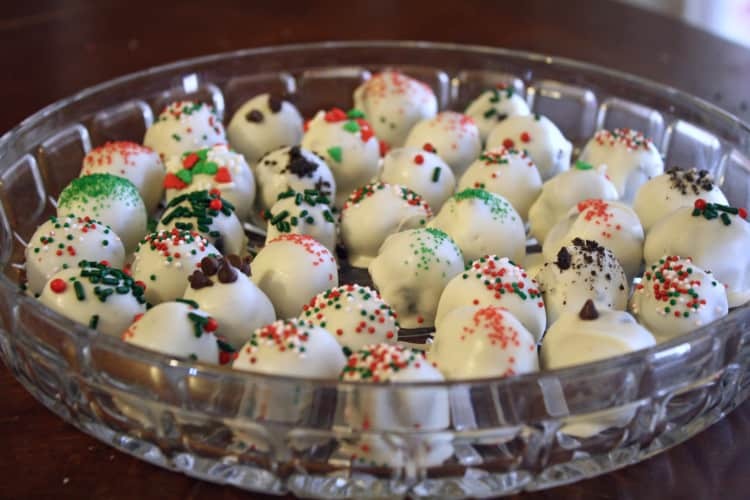 Dip balls in melted almond bark, candy melts, or chocolate. Place them back on the wax paper and add sprinkles or other decorations. Refrigerate 1 hour or until firm. Enjoy!! Have you tried rolling these in your cake ball machine? I wanted to ask you do you make the whipped cream icing, I do not know if you have to put it in the frig or not. It is like what Sam’s uses. Also, if you do can you post the recipe, is it easy to make. I like it because I do not taste that Crisco taste. Also, that icing that is shiny that you decorate cookies with, is that royal icing. I make the crusted cream cheese icing and it is good, but it is not real smooth on my cookies. I do not know if it is suppose to be smooth or if I am doing something wrong. Thanks so much for your help. I love your site you are so down to earth. Hey, I wanted to ask you do you know of any one that teaches how to make hair bows like the boutique hair bow or a site that I can go to, to see how to make them. 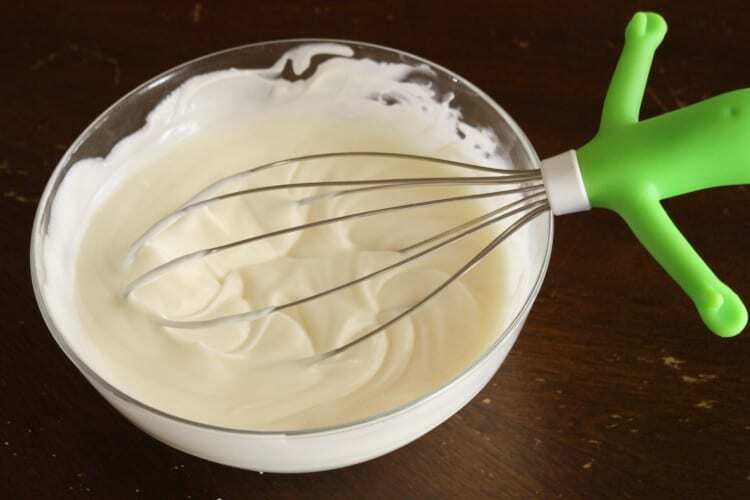 I’m sorry – I don’t make whipped cream icing. I do make royal icing for cookie decorating and this is my recipe: https://rosebakes.com/valentines-cookies-royal-icing-recipe/.